“That’s a red flag”: When does a bump on the head need medical attention? Migraines run in my family. My grandmother suffered quite badly with them, and my aunt still does. Whether it was hormones, stress or a combination of the two, when my mum was diagnosed with pancreatic cancer, the migraines seemed to double down. After multiple scans and tests, doctors couldn’t find the cause. So, I accepted it for what it is – a chronic condition that affects millions of people around the world, albeit in varying degrees. I have friends who believe they have a migraine when really, it’s just a severe headache. And I have friends on the other end of the spectrum who have been hospitalised. I thank my lucky stars every day that I have been able to manage my migraines 70 percent of the time. That was until I fell pregnant. In the first few weeks of my pregnancy, I was getting two or three migraines a week. Only my close family knew I was pregnant and I was still working, so on the days where I could manage, I just had to. I have pictures of me sitting at my desk with an icepack strapped to my forehead and at the base of my neck so that I could hit deadlines. 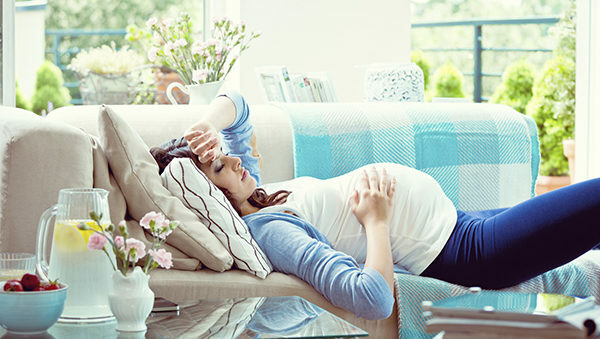 Throughout my pregnancy, I saw a doctor specifically to help me manage the issues I was experiencing – migraines, blood pressure and borderline gestational diabetes. She told me that the key time was 16 weeks. After that, the migraines will either disappear or become a thousand times worse. Oh goody. I was one of the lucky ones. For the second half of my pregnancy, I was migraine free. I got used to this delightful lifestyle until they hit back with a vengeance. And this time, I had work and a child to deal with. Like any chronic condition, migraines do not care that you have other commitments. They don’t care that you may have a screaming child, aching for your attention while you try to bury yourself in the darkness because the dim lights outside seem to make your head shatter. Since having my son, my migraines, although becoming less frequent, have become less manageable. Often, I’m woken up in the middle of the night or at first daylight with searing pain radiating through my head. I am forced to lie on one side because putting pressure on the other side makes it a whole lot worse. My two-year-old doesn’t quite understand the extent of it, although he does come and kiss my head better. Migraines are not headaches. I can assure you that everyone who experiences migraines wants you to understand this. We are not complaining over a headache. Migraines are a neurological condition and despite being an ‘invisible illness’, the pain, nausea, sensitivity to light, noise and sometimes even smell and touch, can be excruciating. Perhaps fueling the fire is the stigma attached to them; that they’re not a real illness. Also, more often than not, those with migraines fake powering through or feeling well because it seems easier than explaining the extent of the condition. I know that I am fortunate when it comes to migraines. The fact that I can placate most of them with some medication makes a world of difference. I am also lucky because if ever I am suffering, and I need to look after my child, my family steps in. I’ve also, to some extent, figured out the magic formula when it comes to my migraines. Well, those that I can control at least. I take a snack with me wherever I go – as hunger is a trigger, so I try to ensure I have some crackers or something in my bag to help me through the day if I’m out and about. I monitor my menstrual cycle – I am quite regular, so understanding my cycle means I can anticipate when those horrific hormonal migraines are going to hit, and I can try to mitigate my workload, or at the very least, I can line up some extra help. I know my limits when exercising – intensive exercise is a big trigger for me. When I used to play netball, I would often come home with a debilitating migraine. Now, I understand my limits, and I try my hardest not to cross them. When all else fails, Bluey comes to the rescue. My son is excellent at self-play, so there have been times when I’ve thrown on some television, taken out Duplo and headed to the couch. I’m still in the room so I can watch him, but at least I can rest a bit. I’ve also learnt not to feel guilty about expecting my son to be a little self-sufficient. He understands that sometimes mummy gets a very sore head and he is such a good helper, it continually amazes me. I know that there are thousands of women out there who aren’t so lucky, and honestly, I salute you, because I don’t know how you do it.